So, without further ado, here are 30 thoughts from the past month or so. 1. My nephew D turned nine. I don’t know where the time has gone! 2. I moved offices at work to sit closer to the team I am now on, after some staff reshuffling. For the first time in 14 years, I have an office that is just mine, and has both a door and a window. 3. With the NHL being locked out to start the year, I watched a lot of the NFL playoffs — and actually enjoyed them. There was some really exciting football going on. 4. There’s a new tiki bar in town, which was inexplicably, but awesomely, playing 90s hip-hop the night Alison, Lori, and I went. 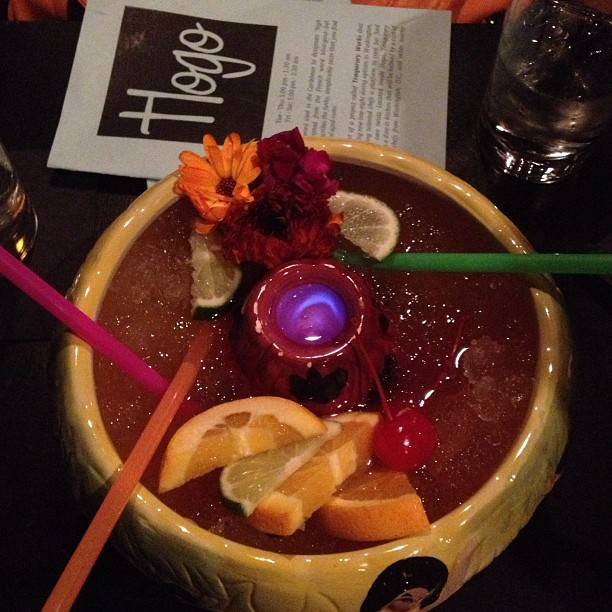 And ordered the volcano. 6. I’ve gotten sucked into the new Kevin Bacon tv show, The Following, even though it makes me feel like I need to have my brain bleached after every episode — it’s very manipulative and extraordinarily violent. 7. Speaking of manipulative, my book group’s January pick was “Gone Girl,” by Gillian Flynn, which I highly recommend. It may not be literature, but it’s definitely a can’t-put-it-down read. 8. Eight… eight… I forget what eight was for. 9. The NHL lockout finally ended! 10. Nobody seems to have told the Caps, however — they’re off to a 3-8-1 start. Only last night’s 5-0 drubbing of the Carolina Panthers has provided any hope that the season won’t be a complete washout. 11. Bad hockey, however, is still better than no hockey. 12. 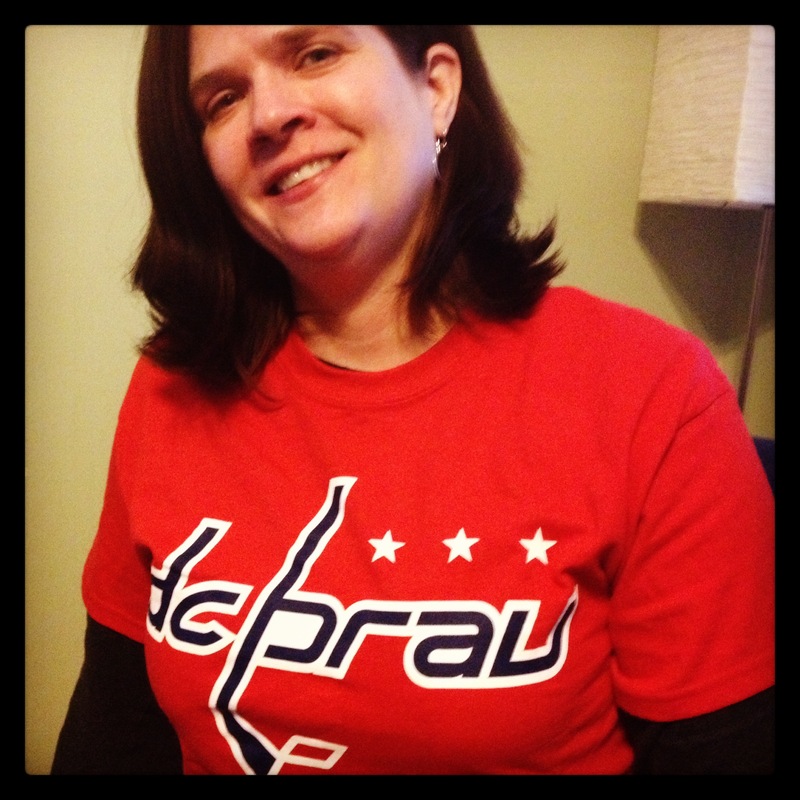 I am wondering, though, if my friend Mary (who went to the game with me last night) is a good luck, because she’s been present for two of the three Caps wins this season. 13. One of the local breweries, DC Brau, made Caps-themed shirts, which provided just the impetus I needed to finally drag my friend Rudi there for growler hours. 14. Rudi also helped me do a “clean install” of the newest operating system on my computer, and recommended a memory upgrade which will make my four-year-old laptop as zippy as new. 15. One morning a week or so ago, I bumped into the soapdish in the shower and it fell right off the wall. It didn’t break, fortunately, though most likely because my foot cushioned its fall. Ow. 16. This past Friday, my friend Alison and I went to get donuts at a new place (Zeke’s DC Donutz) owned by a friend of hers. We happend to arrive just as the staff was about to do a tasting of a new donut recipe, and we were invited to join in. This is about the best way ever to take a break from work, in case you were wondering. 18. I’ve been slightly obsessed by the discovery of Richard III’s remains under a parking lot in England. Finding him was such an amazing collaboration between the history and science nerds! 19. I wrote a guest blog post for the Preservation Alliance of Minnesota about the Twitter chat I manage. If you’ve ever been wondering what the hell that is, here’s your chance to find out. 21. 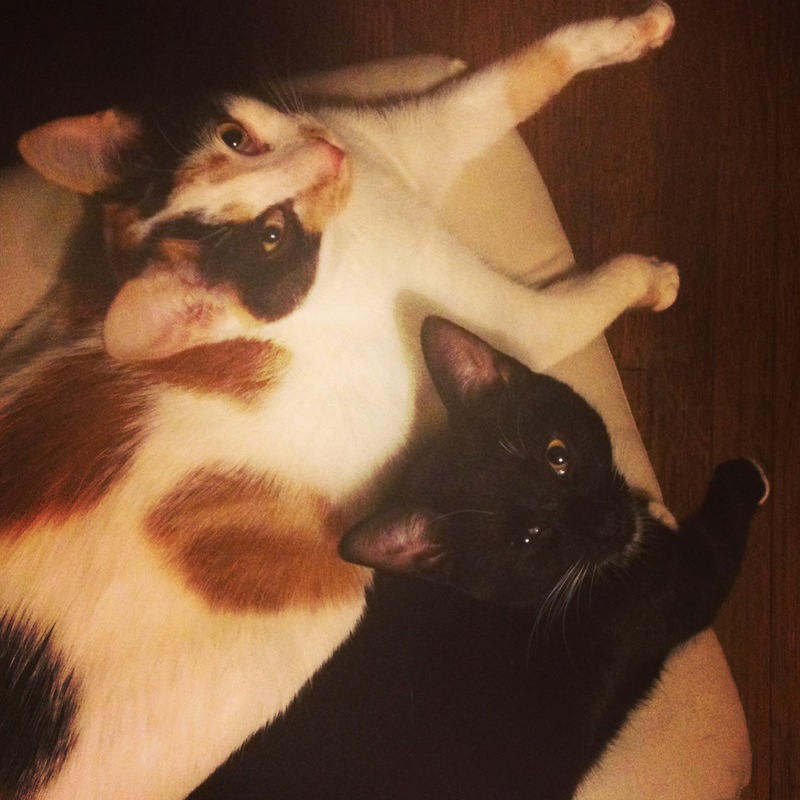 The kittens are still insanely cute, and Carly is well on her way to being enormous. 22. I’ve seen four of the nine movies nominated for Best Picture (“Argo,” “Les Mis,” “Silver Linings Playbook,” and “Lincoln“). I don’t know if I’ll get a chance to see the other five, but my money is on Argo nevertheless. 24. I’m a little bit addicted to the debut albums from Fun. and the Lumineers and couldn’t be happier about the return of pop music that sounds vaguely like showtunes, and that folk-inspired music is having a resurgence. 25. It actually got cold enough for a couple of days that I got to drag out the giant, puffy coat I bought to wear to the Winter Classic a couple of years back. First time I’ve needed it since then. 26. Less than a week after I needed my warmest coat, I didn’t need a coat at all outside — and it’s yo-yo’d up and down since then. 27. Of course, complaining about the variable weather here seems unkind when so much of the northeast got buried in almost three feet of snow this weekend. 28. 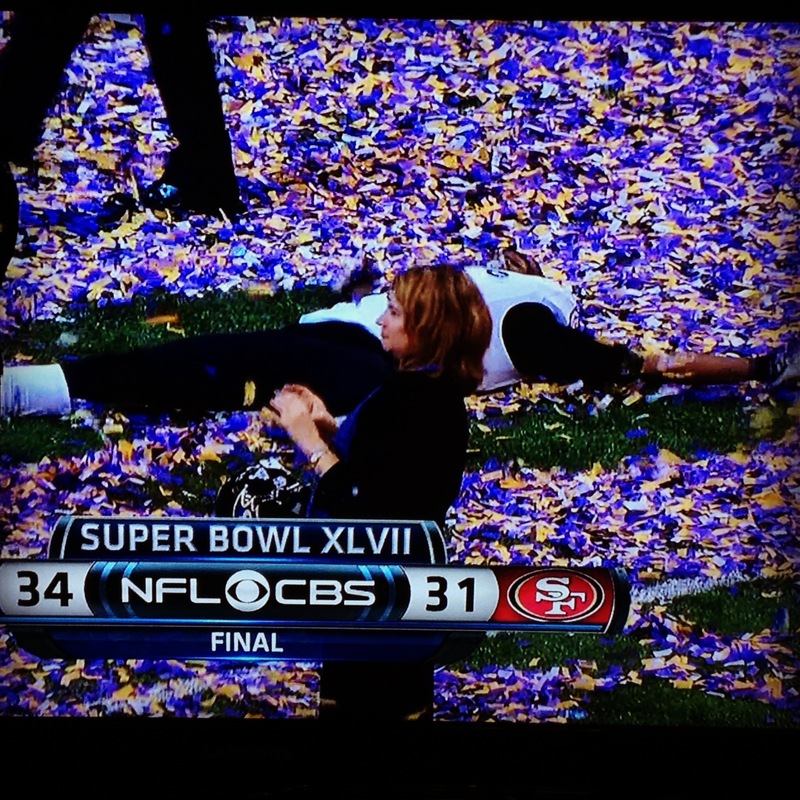 One of the Ravens players made a snow angel in the confetti after they won the Super Bowl, which was just about the cutest thing I’ve ever seen. 29. I wish tomorrow was Presidents’ Day and therefore a holiday, but alas, it’s not until next week. On the bright side, I ordered king cake for the office tomorrow, so there’s that to look forward to. 30. The blog got a bit of a refresh, with a new, responsive theme. This means it should look equally good no matter whether you’re reading it on a desktop, laptop, tablet, or phone. Feedback is greatly appreciated. Phew. I’m done. Never trying that again. Thanks for reading, if you made it this far. * If I’m being honest, I’m also stealing it from Japer’s Rink, one of our local Caps blogs, who started their own riff 30 Thoughts this past week. Though I read Friedman’s column regularly, it never ocurred to me to steal it until Japer’s Rink did it first. Wasn’t sure if you were going to come back or not, but very glad you have! I like this look better, it looks cleaner (I didn’t realize how I let the sidebars distract me, but it’s nice to still find that stuff at the end of your update). And the photo you picked for the top…love it. Missed you too. So glad you’re back! WELCOME BACK!!! That’s an impressive list for 6 weeks of catching up! And, yes, I know it is 3:30 a.m. But I have a throbbing eye — self diagnosis is conjunctivitis (“pinkeye”) — at my age!!! I’ll let the doc confirm tomorrow.